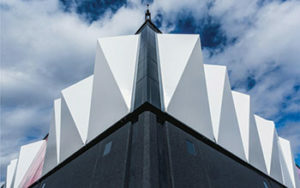 As part of an exciting £4.5 million transformation of Birmingham’s NEC, Base Structures has installed a stunning fabric façade to the exterior of Halls 1 and 5. Designed by architects Acivico, the 6860sqm of printed fabric panels and backlit pyramids create a striking visual effect, giving the NEC a futuristic new look for its 7 million annual visitors. Base Structures also supplied and installed a programmable colour wash backlighting feature with an infinite colour range, adding to the immersive effect. This entry was posted in News and tagged Building. Bookmark the permalink.